Today we cover Comes vs Microsoft Exhibit px08592 (September 2002) [PDF]. It is included as text in the Appendix, but here are key observations. Studies of GNU/Linux penetration in different countries are presented, based on some surveys. There are charts to show this, but the B&W (greyscale) scans make them impossible to read. This firm, eTesting Labs, seems to be doing work for Microsoft. We will soon show more exhibits where Microsoft negotiates with Gartner and/or IDC for the sponsored, slanted TCO study referred to in this exhibit. It was secretly linked to a desktop Windows price break deal. This would not be the last such case because in another court case Gartner is shown negotiating Vista coverage with Microsoft. IDC does the same sorts of things and it’s a typical routine which involves Microsoft. Sooner or later we shall shed some more light on IDC and Gartner, both of which are corruptible and influenced by Microsoft. They occasionally attack Free software, unsurprisingly. Additional market data was put into this presentation and “The Linux Desktop Playbook” has a reference to EDGI, which starts on page 10. Pages 12-13 contain concrete field examples, EDGI “wins” with amounts of money committed/spent in Mexico, Malaysia, Egypt, and Tunisia; Jordan pending at the time. India is obliquely referred to on page 14. “BRIC” stands for “Brazil-Russia-India-China”. Its important to engage with the proper BDMs on a business level discussion and not get caught up with technical folks in a religious discussion. We saw lots of this in the OOXML fiasco. Microsoft did not want to talk about technical things, so it sent non-technical people. A Linux costs less Just because the software license cost is free, doesn’t mean the cost of using Linux Is less than Windows When you consider both direct costs (additional deployment, management, support costs) and indirect costs (end user down time, loss of productivity, etc ) Linux costs more than Windows! -TCO challenge. The Windows Client PMG is offering to the field to fund 20 Gartner audited Linux desktop TCO studies in FY03 (5 per region. We will send in someone from MSC to perform a detailed cost analysis of Linux vs Windows XP using a Gartner approved TCO methodology. Since we will use the customer’s own data — there can be no arguing the results. Gartner will audit each study to approve the specific results from each company. If the customer still pushes back . . This ‘bought’ study from Garner was conducted in the home of “Linux Torvalds”, according to Microsoft. -Linux touts open source as a key advantage. The reality is that most customers would never work directly with the source code and compile the system themselves – that would be like taking on the role of system integrator or OS vendor themselves. That’s a lie because one needs only to rely on other programmers or even forking with shared resources. Microsoft mentioned visibility of its code in special circumstance, but that totally misses the point. Slide 11 mentions CompHot and EDGI again. 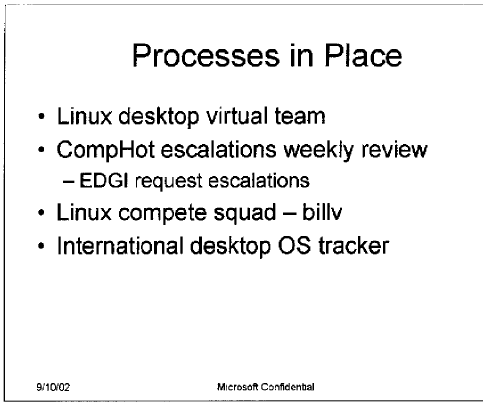 According to Microsoft , CompHot is the emergency address to fight “Linux infestations”. Here are details of what Microsoft did, as per slide 12. They target Linux migrations on just about anything, even points of sale and embedded. So EDGI was used against Jordan, Egypt, Tunisia, Mexico and Malaysia. Q1/Q5 What operating systems are running on your organization’s desktop/portable computers? Q15 Are you expecting some other OS to become your primary computer OS in the next 6-12 months? – Point out that each subsidiary should have a method to track Linux threats and that these should be reported back to Redmond. - Its important to engage with the proper BDMs on a business level discussion and not get caught up with technical folks in a religious discussion. – We have a much more robust platform elevate the discussion beyond the OS if appropriate. - Enables govt to support local sw industry. I like this one. Microsoft basically compares upgrading the version of an operating system to the transition of one OS to a different one. I wondered if they mentioned that if/once GNU/Linux were the original OS, “switching” to Linux would not be nearly so costly :). I also wonder if they ignored not having to upgrade hardware to the same degree if GNU/Linux were being deployed. Stay tuned as I have lots of antitrust material on IDC and Gartner. Truth is, most of the studies are actually right, however they are not showing the hidden costs of Linux, they are showing the hidden cost of the dependence IT grew on windows, I wonder if the next generations are going to overcome this problem, cause it is really big, we need actual competition in the OS side of things -Else everybody is screwed- and until this MS-addiction is cured that seems hard. Like diamonds, MS lock-in is forever. I wonder if MS is going to do this Open MUI stuff, it certainly aligns with all its actions that seemed to intend to make sure that ‘openish’ appears to be as good as truly open. Wonder what Miguel de Icaza has to say about his homeland selling out to MS, I also wonder what Mexican tax payers have to say about such massive sum ‘committed’ to MS. I asked him about it, but he did not reply. He reads this Web site every day, so I hope he’ll remark on the issue.